I'm pretty sure you've all noticed that earlier this year Yves Saint Laurent's nail polish range has completely been rethought : new design and a wider core collection. Among this new range, a few reds but mainly oranges, corals, pinks, purples, taupes and blues, enough to make your head spin! Today, for this 1/2 post, I have 2 warm colors to share with you Rose Renaissance and Orange Fusion. 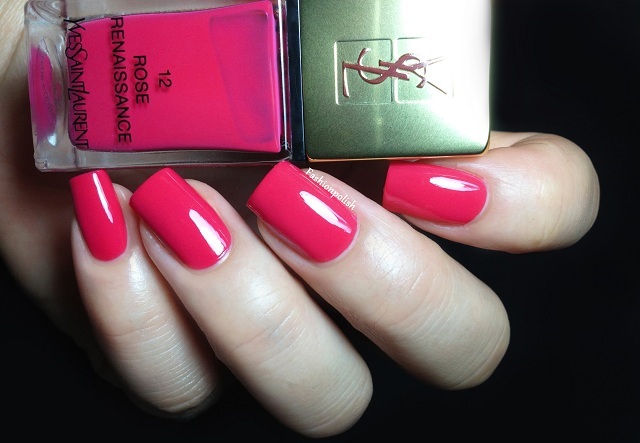 Rose Renaissance is a bright and saturated pink. It has a very slight blue base and although it's very vivid, it's also dark enough not to appear neon or too summery. Application was a dream, even and pigmented on the first coat, smooth and perfect on the second. This is two coats plus topcoat. 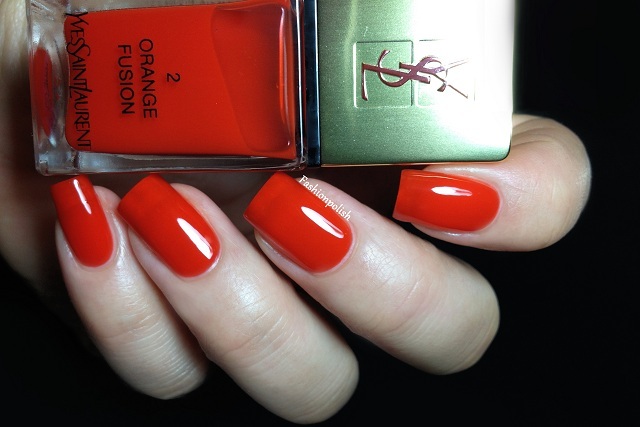 Orange Fusion is a relatively dark and extremely glossy red based orange jelly. It's just so intense and glass smooth on the nails! I used 3 coats in these swatches but didn't achieve full coverage. An extra coat might eliminate the slight VNL but I didn't mind enough to apply one. I still can't believe I'm actually wearing and loving pink nail polish! To my defense Rose Renaissance is beautiful and rather sophisticated. But despite the lack of opacity, I must admit that Orange Fusion simply stole my heart away. 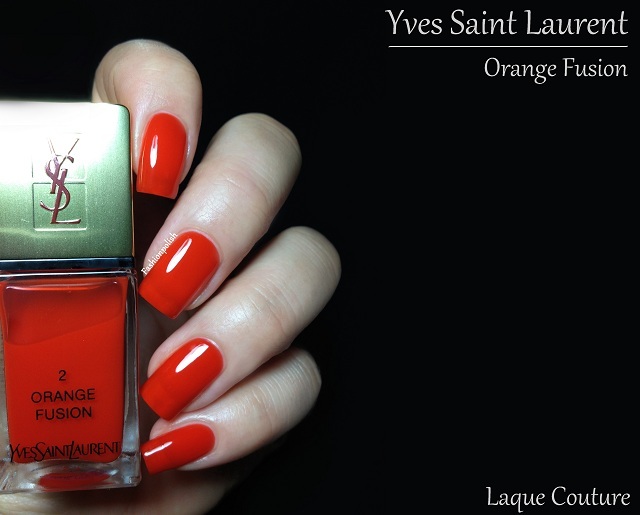 For more information, please refer to YSL.com and select your location. I really love Rose Renaissance! It's such a happy pink! Wow, that Rose Renaissance is yummy!!! I'm really loving the shape of your nails and you take fantastic photos! 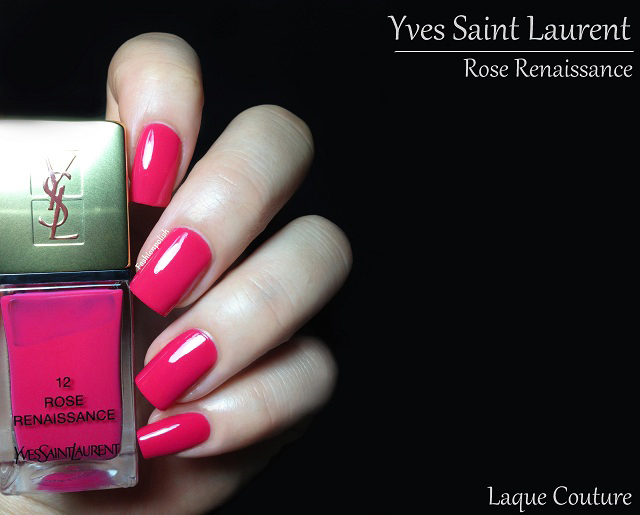 pink looks too good.. lovely colors from the designer Yves Saint Laurent. They are gorgeous! The jelly is stunninggg! I want, I wanttt! Rose Renaissance is a stunner!